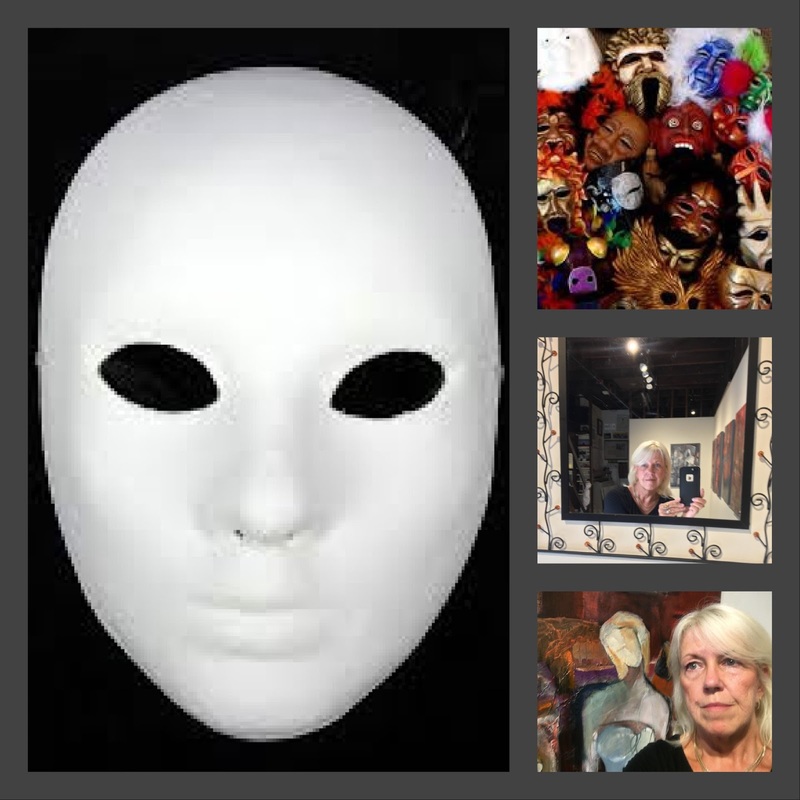 Weiner-Reed's Solo Exhibition "Masks and Mirrors"
Show Location: Holley Gallery at The Maryland Federation of Art (MFA - Circle Gallery) - 18 State Circle, Annapolis, MD 21401 (410-268-4566). Our story is being written as we speak. This exhibit raises the bar. 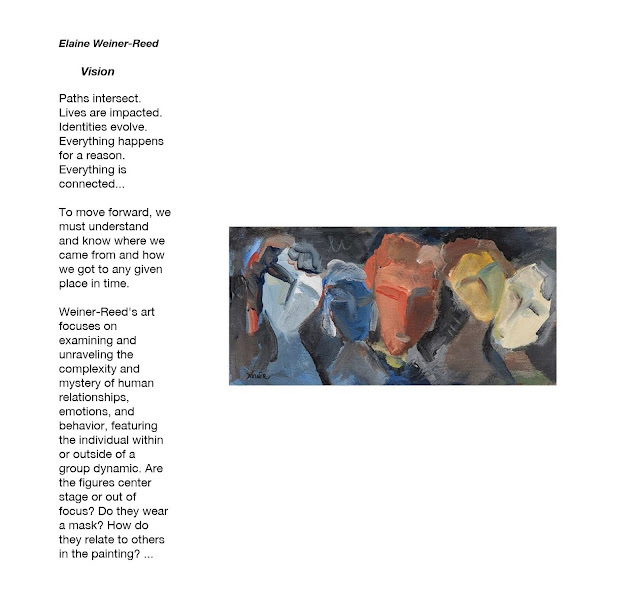 Not only does EWR's exhibition provide a rich visual and intellectual feast, it also provides audio companion tracks to accompany guests on their art gallery tour. 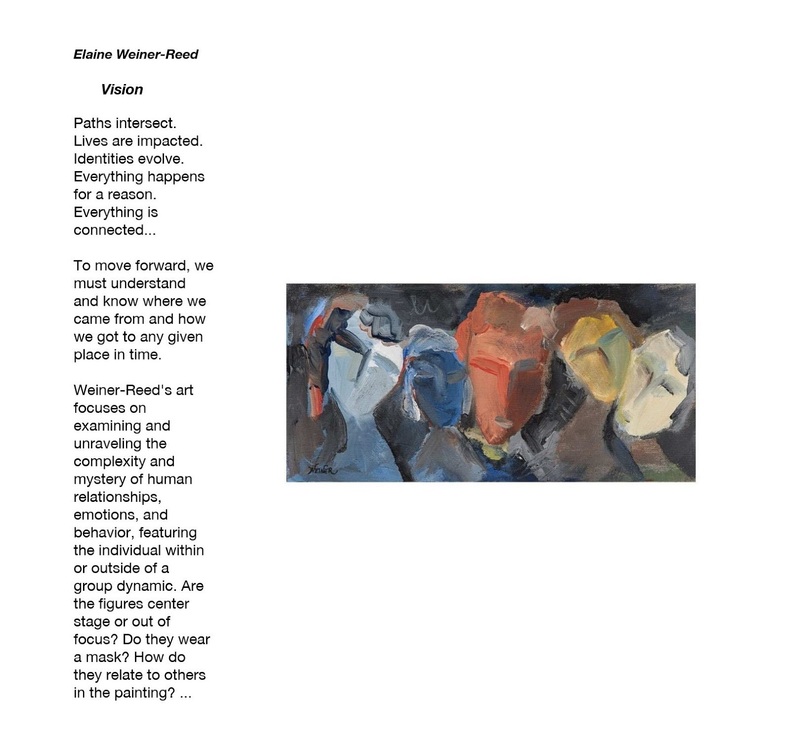 These audio soundtracks (two for each of nine paintings: a universal reflection and Elaine's personal reflections) guide you through the exhibition. They can be found in two locations for the duration of the solo exhibition only on the Artist's website in the Solo Exhibitions tab and on EWR's SoundCloud channel (EWRARTIST) at the following link: http://soundcloud.com/user-615231174 . before the end of September...or miss a rare opportunity. Join the artist for her Reception (24 September, 2PM) and don't miss out on engaging all five senses: a) Taste: reception treats - tastes of her travels; b) Smell: "perfumes:" scents of French cheeses; c) Sight: vision - bold or subtle colors, shapes, and Elaine's unique calligraphic lines in her paintings; d) Hearing: auditory - listening to the soundtracks and an Artist-led Gallery Talk on the role of masks in modern cultures (and "masks" of other dimensions); and e) Touch: tactile - try on masks and/or make a simple one yourself during a hands-on, interactive mask-making segment (24 Sept. -2:00 to 3:00 PM). Throughout, guests are encouraged to participate in conversation and open dialogue. Take your time and explore the world within each painting. Engage your senses and your imagination! For a short time, guests may take a virtual visual and audio tour of Elaine's solo exhibition "Masks and Mirrors." 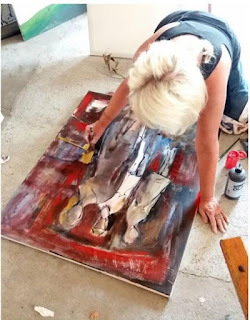 Think museum exhibitions... That is what Elaine strove for and hers is a curated museum quality solo exhibition at your local Maryland artist venue. Although nothing can replace being there and putting all your senses to work, savoring the experience live, within inches of rich and complex, intriguing paintings in the real world, Elaine tried to duplicate the experience in her online virtual gallery tour in the hope that it is the next best thing to your being there. Art in action, supporting artistic freedom, communication, and community. 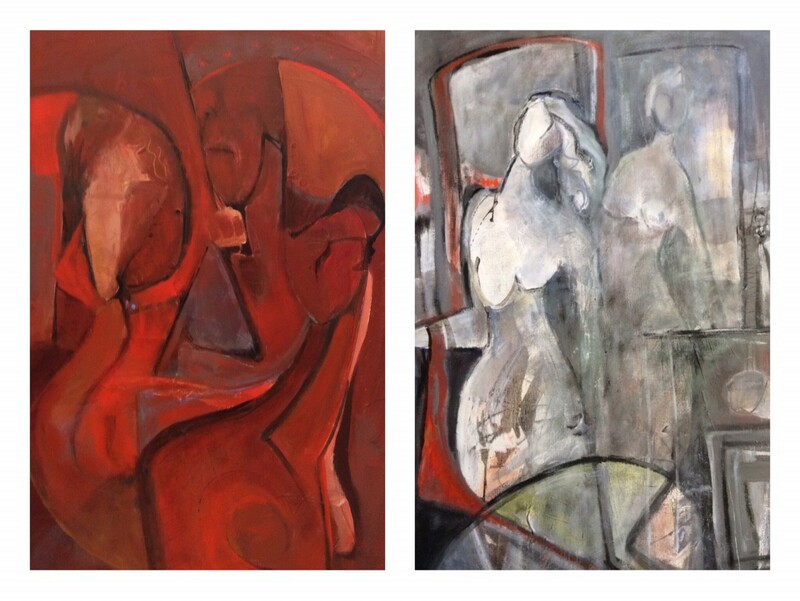 All paintings in the exhibitions are for sale. For inquiries and prices, contact MFA or the Artist. The Artist will consider all serious proposals to exhibit and stage this show in galleries, museums, and universities. Thank you for your time, attention, and support!